Media Credit: Senior Associate Provost for Enrollment Management Laurie Koehler said she hopes GW will attract a more diverse range of students now that it has gone test-optional, a move that mirrors hundreds of other schools. Senior Associate Provost for Enrollment Management Laurie Koehler said she hopes GW will attract a more diverse range of students now that it has gone test-optional, a move that mirrors hundreds of other schools. Experts are questioning GW’s latest strategy to bring in a more diverse group of applicants. When GW announced last week that it would no longer require applicants to submit SAT or ACT scores, University officials pitched the policy change as a way to attract “underrepresented” students. But amid a rising acceptance rate and financial struggles, experts are skeptical the plan will be effective. GW relies heavily upon tuition to fund roughly 75 percent of its operations and boasts a cost of attendance of more than $60,000. As a result, experts doubted whether removing the test requirement would do anything to increase financial and racial diversity among incoming undergraduate classes, experts say. Experts also said GW could admit students that don’t submit low test scores, but can afford to attend without a financial aid scholarship, in turn boosting the University’s revenue but hurting its financial diversity. Laurie Koehler, senior associate provost for enrollment management, said in an email that with the change in application requirements officials hope to bring in both a more diverse applicant pool and create a less homogenous undergraduate student body. She said that officials believe an “academically talented and diverse student body” is necessary to succeed. “We want outstanding students from all parts of the country and world, and of all backgrounds, to see GW as a place they can thrive, and we hope that the test optional policy sends a message to prospective students that if you are smart, hard-working, have challenged yourself in a demanding high school curriculum, and have done well, GW could be a good fit,” Koehler said. In March, GW accepted 45 percent of undergraduate applicants, the highest acceptance rate in more than a decade. Officials said the bump in acceptances was part of a strategy to inflate the size of the freshmen class in order to grow revenue after a budget crunch led to 5 percent budget cuts across divisions. Koehler said there was “no correlation” between the change in admissions policy and the administrative budget cuts and that the decision was made with solely “removing barriers to the application process” in mind. The University gave need-based scholarships to 83 percent of students last fall, and 17 percent of students received need-based scholarships. The financial aid pool grew 6.5 percent this past spring, the largest increase in six years. About 40 percent of undergraduate students enrolled in 2014 were minorities, according to GW’s office of institutional research and planning. Koehler declined to answer specific questions on how the change would impact the percentage of students in incoming classes who are eligible for Pell grants, federal financial aid grants that are given to students with financial need, or if officials expect the number of students who eligible for Pell grants to increase. In 2014, about 14 percent of GW students received Pell grants, a percentage that has increased from 9 percent six years ago, part of GW’s commitment to stepping up recruitment of low-income students. The government most often awards Pell grants to students whose families make less than $20,000 a year, making it a common marker of an institution’s accessibility and diversity. Experts say that while overall diversity at some small liberal arts colleges has increased after becoming test-optional, it’s too early to tell if becoming test-optional has increased financial or racial diversity at universities that have made the change. Robert Kelchen, an assistant higher education professor at Seton Hall University, said that test-optional applications benefit two groups of students, low-income or minority students who on average have lower test scores and “dumb rich kids,” and added that he’s “skeptical” about whether becoming test-optional will actually increase access for lower-income students. Kelchen said that because GW is likely to see an influx of applications after becoming test optional, the University can afford to be more selective in the students they choose to admit, and those students might bring in more revenue, especially if students with lower test scores who can afford to pay full tuition will now be admitted. He added that this change could in turn lower GW’s acceptance rate, which was at its highest in 10 years for this upcoming fall. “If you increase applications, you can look more selective. If you look more selective, you seem more prestigious,” Kelchen said. Kelchen added that another benefit of becoming test-optional was a potential boost in GW’s rankings, because only students who did well on standardized tests would submit their scores with their application. GW was kicked off of U.S. News and World Report’s rankings for a year after misrepresenting admissions data in 2012, including how many members of the freshmen class were in the top ten percent of their high school class. 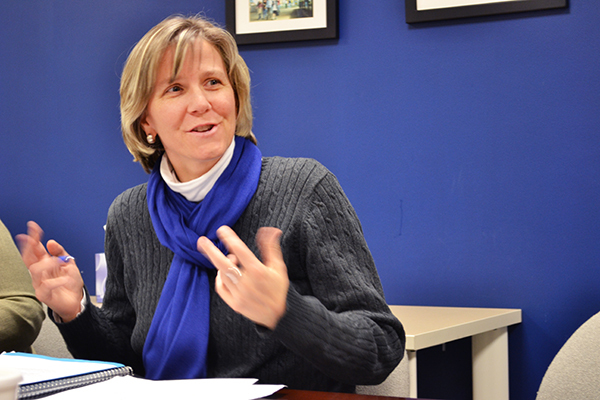 Anna Ivey, an admissions consultant and former dean of admissions at the University of Chicago Law School, said that while GW may see an increase in applications from students who would have been discouraged to apply otherwise, admitting low-income students “conflicts with the reality” that the University needs students who can pay full tuition. Two years ago, GW admitted publicly for the first time that it put hundreds of students on the wait list each year if they could not afford to pay full tuition. “If their goal is to get more kids to apply to GW who are lower income, I’m wondering how they’re going to get paid for it,” Ivey said. Officials have pointed to GW’s latest fundraising success as an indicator that financial aid can continue to support students. As part of GW’s $1 billion dollar fundraising campaign, $50 million has been raised for the University’s Power and Promise Fund over the past two years, which gives donor-supported scholarships to students in need. “We hope that a more socioeconomically and racially diverse applicant pool, including a pool that has more first-generation college students, will result in growth in the diversity among our enrolled students,” Koehler said. Last year, the University hosted students from a Southeast D.C. high school through the nonprofit Serve Your City to help students learn more about the college application process and learn more about GW. The move to make GW test-optional was recommended by a University task-force, started in 2014, to help low-income students find success at GW. University President Steven Knapp has made college accessibility and affordability a priority during his administration, attending a White House summit about college affordability last year.